For the first time in stunning blu ray high definition Academy Award winner Robin Williams delivers a tour-de-force performance in the 25th Anniversary Edition of the hit comedy Good Morning,Vietnam. Enjoy the unsurpassed digital sound quality of blu ray high definition as military deejay Adrian Cronauer(Williams) spins a red hot soundtrack of 60's hits. His sidesplitting comedy and rapid fire wit make him a hero to the troops, but quickly get him in hot water with his by the book superiors. 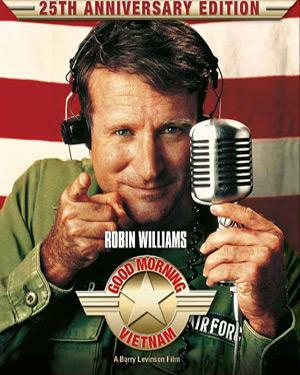 Featuring a behind the scenes look at Williams' hilarious radio monologues, Good Morning,Vietnam remains the quintessential Robin Williams comedy. More details of Good Morning Vietnam on wikipedia. Original Good Morning Vietnam DVD released by SONY Pictures comes in 1 disk DVD pack. DVD having 3 Subtitle. While processing the order, we bubble wrap the DVD in its original packing and send it in sealed plastic or carton pack. We don't offer download of the Movie Good Morning Vietnam, nor we send free poster of the Movie along with its DVD order. We also don't offer free wallpaper or song download of the Movie. Poster and other accessories of the Movie can be purchased separately. Buy English DVD Good Morning Vietnam and watch them at the comfort Of your own home. Online shopping Good Morning Vietnam DVD, Buy Good Morning Vietnam DVD, purchase original English DVD of Good Morning Vietnam. Online store to buy Good Morning Vietnam DVD	, online DVD store india, buy English DVD, watch English movie Good Morning Vietnam videos online. We don't offer DVD renting for English movies online, Buy Original Good Morning Vietnam DVD @ discounted and cheapest price online in India.